This site will remove your mug shot — for a price, authorities say. Its owners are charged with extortion. Ever since the fall of 2013, Jesse T., of Sonoma County, Calif., has found it nearly impossible to land a job. He’s applied for construction, manufacturing, and electrical positions, with no luck. After nearly a year of unreturned calls and emails, his friend alerted him to a troubling Web page. Was Jesse in prison, his friend asked, according to an arrest warrant, which did not give Jesse’s last name. When Jesse searched his own name in Google, the first result was a post on Mugshots.com, a website that mines publicly available arrest records from across the country. It indicated that Jesse had been arrested, and included his full name, address and the reason for his detention. Jesse was, in fact, arrested in September 2013, but he was never charged with a crime. He was simply detained for 12 days and then released. But Mugshots.com made no such distinction. Jesse became convinced that the post, which included his full name, address and the reason for his detention, had ruined his reputation, making it difficult to find a job or even start a romantic relationship. He clicked on a link to a related site, unpublisharrest.com, which offered to remove the information — but demanded that Jesse pay $399. He called a number associated with the web page, and told a man on the other line that his demands were illegal, according to an arrest warrant. The man laughed and hung up. Jesse is one of thousands of people across the country who California prosecutors say have been extorted by Mugshots.com. Between 2014 and 2017, Mugshots.com allegedly took more than $2.4 million in fees from at least 5,703 people nationwide who wanted their photos removed from the site, California Attorney General Xavier Becerra said in a news release Wednesday. About 175 of those individuals had billing addresses in California. Becerra has filed charges of extortion, money laundering, and identity theft against four men who are allegedly behind Mugshots.com. 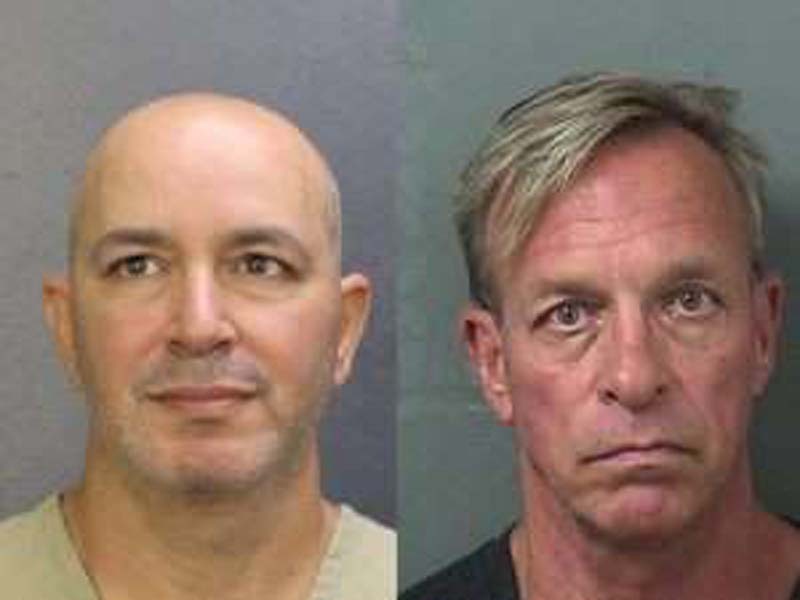 The arrest warrant, which seeks to extradite the men to California, names Sahar Sarid, Kishore Vidya Bhavnanie, Thomas Keesee, and David Usdan as the alleged owners and operators of Mugshots.com. None of the men could be located for comment. The website appears to still be operating as usual. Mugshots.com is one of several websites nationwide that make money by publicizing arrest information and demanding fees through intermediary sites to swipe records clean. Mugshots.com and similar websites say they are simply republishing arrest information that is already publicly available through government records. Mugshots.com shows a disclaimer in capitalized letters at the top of its Web page saying the information on its website is in no way an indication of guilt or evidence that an actual crime has been committed. But to many people whose photos have cropped up on the site, such disclaimers are not enough to make up for the damage to their reputation. Mugshots.com refuses to take down criminal record information unless that person pays a fee, usually $399, through the secondary website, Unpublisharrest.com. They make no exceptions — even if the person’s charges were dismissed or if the arrest was due to a mistaken identity or law enforcement error, according to a law enforcement affidavit, which included interviews with 18 people. Websites like Mugshots.com have been operating for years, particularly in Florida. In 2012, the Miami Herald called mug shot websites the “hot new internet business.” One of the first such websites appears to have been Arrrests.org, operated by Rob Wiggen, a 33-year-old Floridian skilled in computer programming. He would post hundreds of new mug shots on a daily basis, mining law enforcement websites in Florida and four other states, the Herald reported. An intermediary website would, in turn, charge people hundreds of dollars to remove mug shots. A number of lawsuits have previously tried to target Mugshots.com. Last year, Illinois resident Peter Gabiola filed a federal lawsuit seeking class-action status against Mugshots.com, alleging it posted incomplete criminal records so that its sister site could solicit “takedown” fees from people, the Chicago Tribune reported. Gabiola said he was fired an hour after starting a new job because the employer saw his retail theft arrest record online. Even after the Illinois Department of Corrections had removed his records from its website, the information was still available on Mugshots.com, the Tribune reported. In 2012, an attorney filed a class-action lawsuit against Mugshots.com and other booking photo websites, but was not able to locate the owners to serve them. The owners of Mugshots.com have tried to conceal their identities by listing their business address in Nevis, West Indies, registering their domain name in Belize and using a website hosting company in Australia, according to the attorney general’s affidavit. They also hide behind dissolved or inactive limited liability companies. In doing so, “the owners avoid service of process by those who have been injured through their business practices, giving their victims no recourse to seek damages,” the affidavit stated. The repercussions of a post on Mugshots.com can carry on long after a person dies. Rosa S., a resident of Ventura County, told investigators her late husband, Tony, was jailed for one night in 1998. He was never charged with a crime, and had no criminal history. In 2002, he committed suicide. Their son has the same name as his father, and when she searched her son’s name on the Internet, the first result that popped up was her late husband’s booking photo. When she called Mugshots.com to have it removed, she was told she would have to pay. U.S. - U.S. Daily News: This site will remove your mug shot — for a price, authorities say. Its owners are charged with extortion.